NanoTech HBU (formerly known as Ultra Clean) is a Heavy Build-Up Remover designed to work where other cleaners won’t. It utilises nano-sized particles to penetrate below tough stains, dissolve and lift them out. Especially effective for cleaning rough or textured surfaces. Also removes factory applied waxes and floor finishes, coating sealers, light grout residue (including epoxy), rubber and pencil marks, light mineral deposits, ground-in dirt and most sealer residues. Nanotech HBU Remover is nontoxic, non-flammable and non-acidic. Use on Porcelain, ceramic, polished and unpolished natural stone (such as granite, limestone, marble, slate, and travertine), grout, quarry tile, saltillo, terra cotta, cement pavers, masonry surfaces, and other stone, tile and grout surfaces. Apply NanoScrub™ directly to the pre-wet surface. Agitate with a white nylon pad, scrub brush or scrub machine. Remove the residue using a wet-dry vac machine. Rinse thoroughly with clean water. 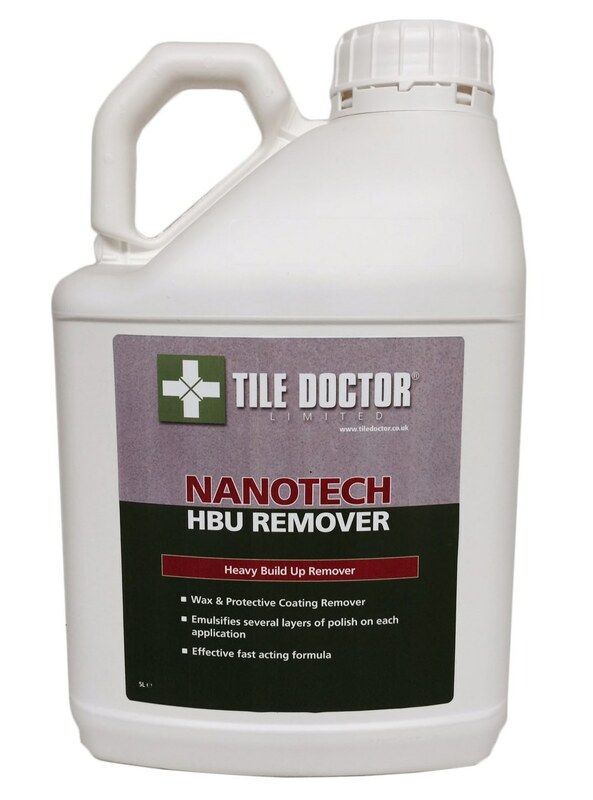 NanoTech can be used as a power booster, with Tile Doctor Pro-Clean according to directions. Apply chosen product to surface, add NanoTech and agitate mixture. Continue to follow directions on the chosen product making sure a clean water rinse is the final step to remove any remaining residue. Approximately 5m² to 53m² (54 to 572 sq. ft.) per 1 litre bottle depending on dilution. Available in 1 litre bottles at £23.00 each and 5 litre bottles at £90.00 each. , Postage and Packing £5.50 for a one litre bottle, £10.00 for two or more litres (All prices are shown inclusive of VAT).